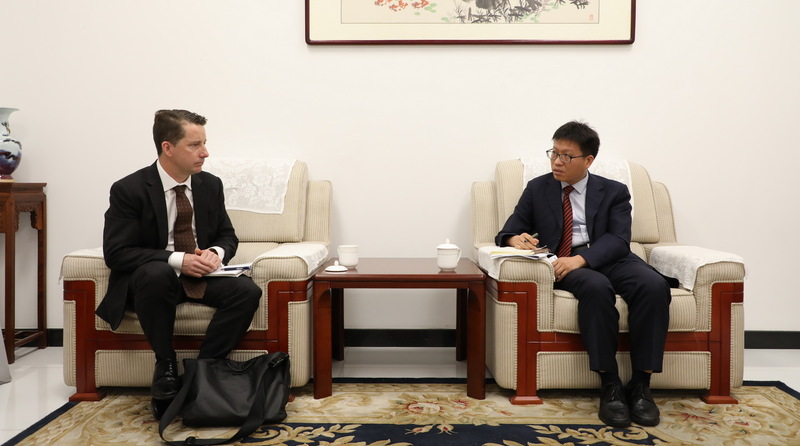 On September 6, Liu Xiangdong, Deputy Director of the Department of Economic Research at CCIEE met with Mr. Rob McKenzie, Director of Investment, Investment and Economics Division of the Australian Ministry of Foreign Affairs and Trade, and Dene Yeaman, Economic Counselor of the Australian Embassy in China. Researchers from the Strategic Research Department and the Economic Research Department of CCIEE were also presented at the meeting. Liu Xiangdong said that China and Australia have strong economic complementarities and the trade and investment between the two countries has experienced rapid development. He hopes that Australia can have a positive attitude towards the investments made by Chinese companies in Australia and ensure transparency and consistency in the investment review process. Rob McKenzie highlighted the Foreign Investment Review Mechanism of Australia. The two sides also conducted in-depth exchanges on China’s development of foreign investment, Chinese companies’ attitudes to investment in Australia, the trend and hot issues in the investment field between China and Australia.